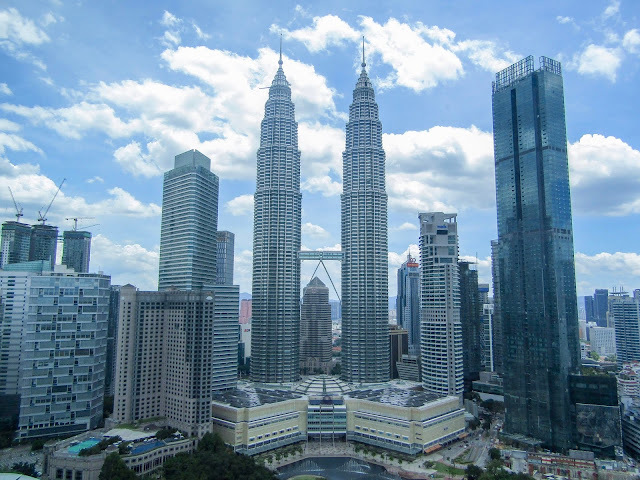 The priority for this trip was to see the majestic Petronas twin towers. They were the tallest buildings in the world from 1998 to 2004 and remain the tallest twin buildings. This makes them very hard to fit into a photograph so many locals wait near the bottom of the towers to sell 'fish eye' attachments to clip onto phones or cameras and help tourists get the full towers in. They are pricey (we paid RM40 or £8 at today's rate) and not the best quality. You can find them for a much cheaper price in KL's Chinatown or online via Amazon so try and invest before you go if possible! We visited at midday which meant it was quite hot and lighting conditions not ideal for pictures. Definitely try and get out early, making this your first stop to beat the crowds and get some great snapshots. After taking lots of pictures we explored the KLCC park situated at the base of the towers. We really loved this place, it's full of pretty water features, tropical greenery and different views of the towers. By this point you will definitely be in need of an air conditioning and coffee break! 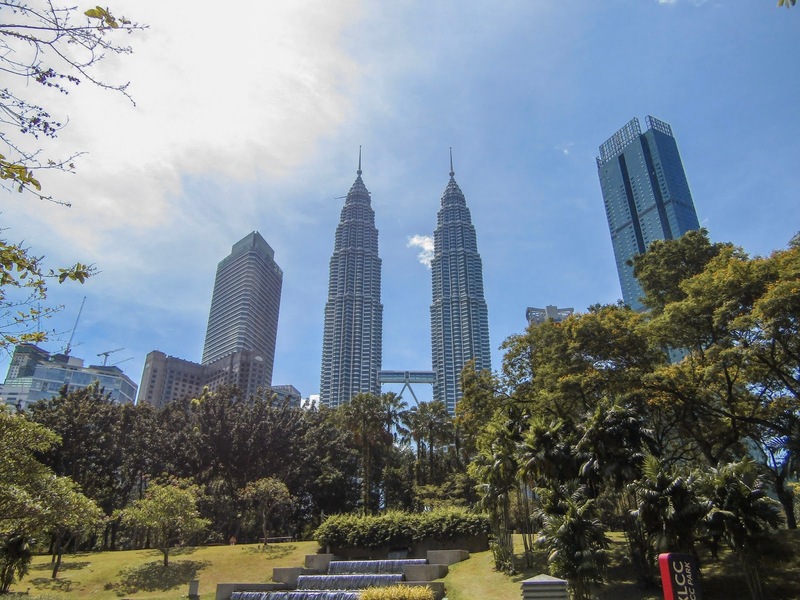 For this I would recommend the Suria KLCC mall which is situated within the towers. It wasn't my favourite shopping centre but it is perfect for a pit stop near the towers for some refreshments. Whenever I visit a new place I can't resist an open top bus tour and I really enjoyed Kuala Lumpur's version. You can buy your ticket on board at a cost of RM55 for 24 hours (£10 at time of writing) which allows you to hop on and off as much as you please. We actually bought our ticket mid-afternoon which meant we could actually use it on two different days which was useful. 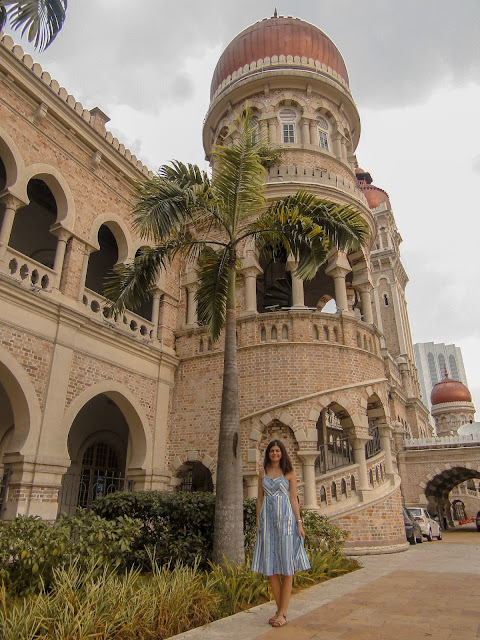 There are some really nice sights to see on the bus tour and beautiful photo stops like at Merdeka Square where you can see the Sultan Abdul Samad Building shown below. Bear in mind that the length of time the guides tell you to take the whole tour can be very off as traffic is heavy in KL! 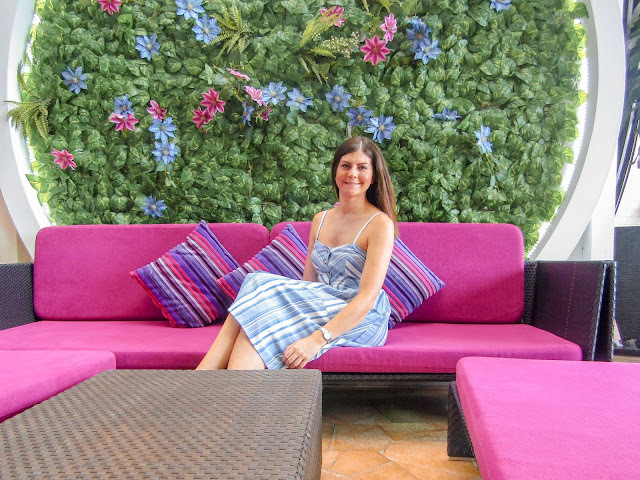 To round off our lovely first day exploring Kuala Lumpur we went to the Sky bar at the top of the Traders Hotel. The drink selection was really good but the main selling point of the bar is the beautiful views of the towers as shown below - this was taken through a window in the bar. For our evening meal we ate close by the hotel at a lovely restaurant called Limapulo where we tried our first Nasi Lemak. This dish is quite hard to describe but consists of a fragrant rice cooked with coconut milk and pandan and a variety of small dishes next to it such as anchovies, peanuts, fried chicken and sambal chilli paste. Our main priority for our second day was to see the Batu caves as we'd heard so much about them and seen some beautiful photos on Instagram. These caves have been around for 400 million years and are so impressive. 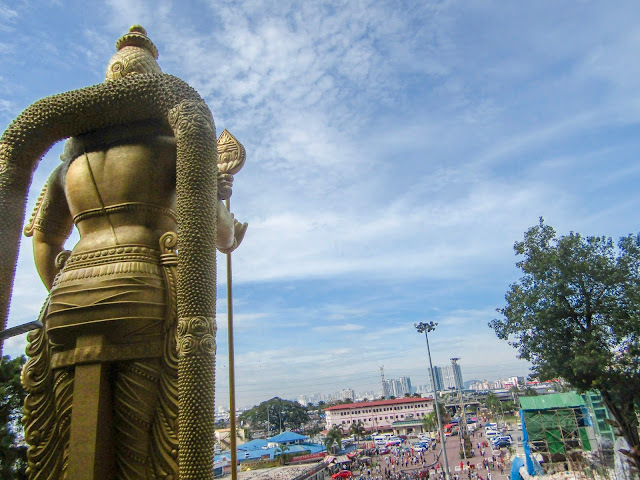 There is a huge statue of Lord Murugan at the entrance which took 3 years to construct and is a beautiful sight to see in itself. We decided to get a taxi from our hotel straight to the caves as the train to get there was replaced with a bus and we were keen to see as much as we could before it got too busy. We used Grab and found it very reliable so would recommend this way of getting around the city. Once you arrive at the caves there are a number of smaller caves with an entrance fee which you can skip if, like us, you are there to see the main cave and the many monkeys inside! There are 272 steps to climb up to the main cave, this sounds so daunting but I wouldn't say I am very fit and I found this a reasonable climb. On the way up to the cave be prepared to be surrounded by monkeys! They are totally used to humans and will think nothing of stealing your personal items so please keep your wits about you and don't bring any food on your visit. Some locals were handing out food items to feed them - they made this look like a kind gesture but I got the feeling if you took the food from them they would ask for money so it is better not to feed the monkeys. There is a beautiful temple inside the cave with some gorgeous ornate carvings. I would say to just climb the steps, see inside the main cave and climb back down takes around 2 hours so I would allow half a day for this trip including taxis. There are a number of shops and eating options at the bottom of the steps but we didn't try any of these as we were keen to get back to see what shopping centres KL had to offer - I don't think a visit to KL would be complete without some retail therapy! There are many shopping centres in the city but we chose to visit the Berjaya Times Square. This was mainly as it has a mini theme park inside it and where we grew up in the UK had one of these which has since been closed so we were keen for some childhood nostalgia! On arrival the theme park was actually mainly geared up to children and pretty small so I would say it's only worth it if you are looking for family friendly activities or it is raining. We really enjoyed the couple of hours we spent shopping, living in the super expensive Singapore has made us appreciate a bargain so much more. The shopping centre had a number of well known high street shops as well as small shops which seemed unique to Malaysia. The dining options were extensive and at lunch time we tried our first Laksa, another amazing food which has quickly made it into my top 5 dishes. Spicy, creamy and satisfying - this dish cannot be missed when in Malaysia. We tried it at the chain restaurant 'The Chicken Rice Shop' which I would really recommend for a safe and easy taste of Malaysian food. Although we had packed in quite a bit of sightseeing already we knew there was only one place we wanted our evening to end - the amazing Heli Lounge Bar! This active helicopter pad transforms into a lively rooftop bar at night, with a huge variety of delicious cocktails and regular DJ sets. The best time to arrive is 30-60 mins before sunset so you can grab a table and enjoy the skyline in daylight, dusk and lit up at night. It was one of my favourite bars I have ever been to so well worth a visit! We walked from here to Bijan, the restaurant we had chosen for our evening meal. This is an absolutely divine Malay restaurant which offers luxurious local food at mid-range prices. We thoroughly enjoyed this restaurant and every course was beautiful. It was right next to Bukit Bintang which has so many lively bars to try, our favourite of the evening being The Rabbit Hole. We were genuinely sad to leave the next morning after a thoroughly enjoyable weekend! 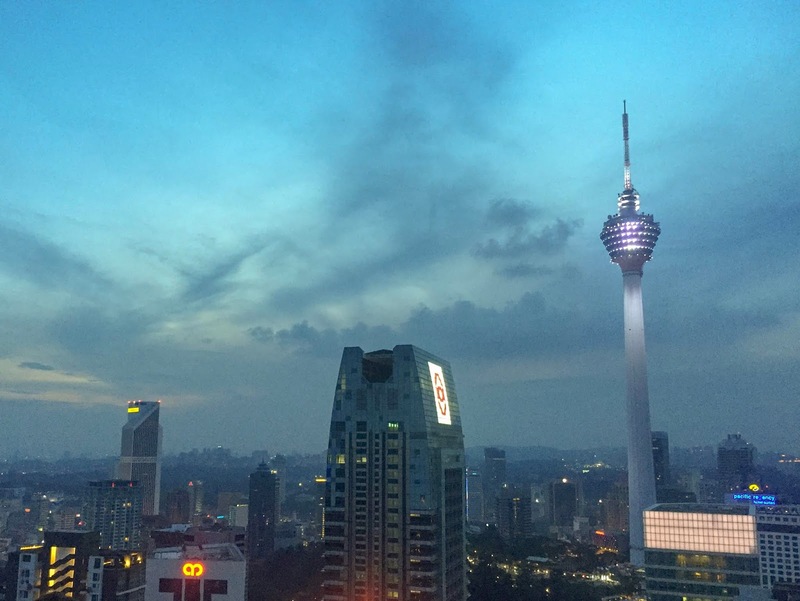 We by no means saw everything that KL has to offer and definitely need to go back (I say this about everywhere we visit!) 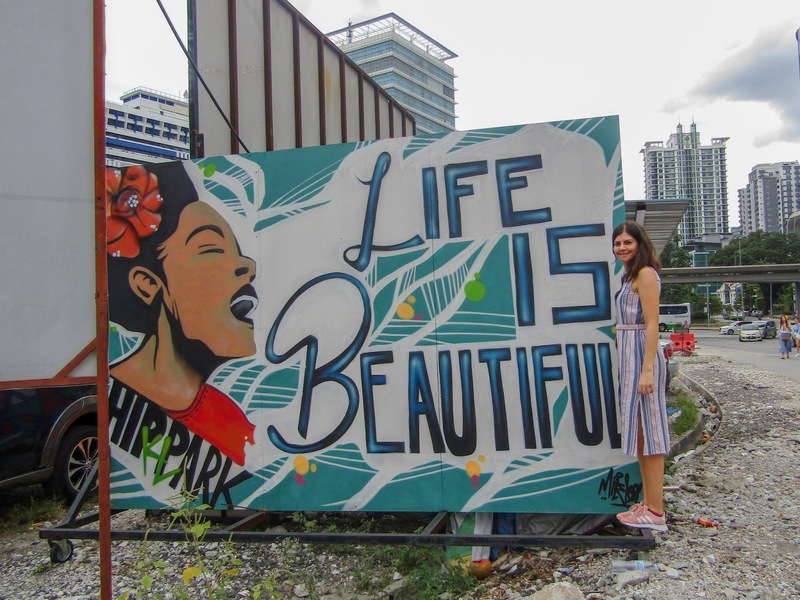 I hope you have enjoyed this snapshot into our short and sweet visit to KL.